Livingstone, on the edge of Victoria Falls, is a great place for a safari, but (unless you want to be charged by elephants) a bit lacking in good running routes.There are a few nice routes in into the national park, but difficult to get to and costly if you want to get near the falls. 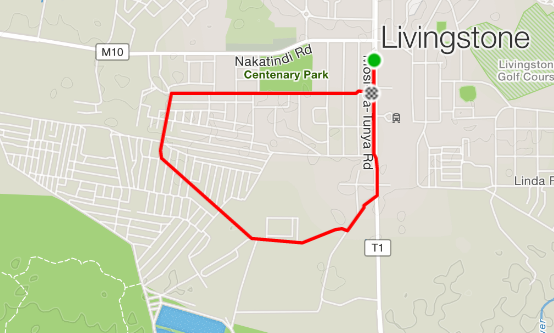 I chose to run some of the local roads, and while I got some funny looks I was able to get a pretty good idea of the non-touristic parts of Livingstone. I got a few funny looks from parents walking their kids to school, but also several friendly hellos as well.